Everybody wants to make money and become rich quickly, and we Indians are no exception to this rule. It is this single-minded obsession that drives lakhs of people across the country to invest in the share market every year. Next to buying gold, investing their hard earned money in the buying and selling of shares listed on the stock market is the favourite recipe for millions of people looking for making a quick buck. However, as with any kind of investments, there are many risks involved in trying to make money from equities. On days when stock prices tumble without warning, you can lose a pile of money within minutes. But on the flipside, if you’re a careful investor who follows all the Dos and Don’ts of investing in the stock market – then it is one of the best ways for you to make quick money. So if you’re already thinking – How can I invest in the share market and become rich myself? Don’t worry; we have you covered it. 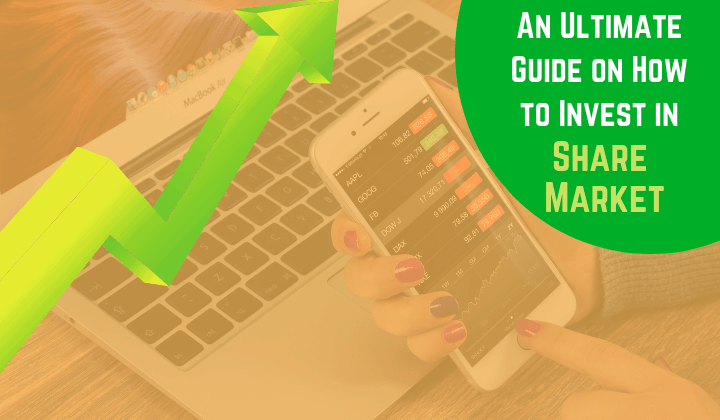 Here is a simple guide on- “How to Invest in the Stock Market” with all the essential tips will help you begin your journey as a stock market investor in India. Before you start investing in the stock market, here’s a complete list of the buys for stock market investments you will need to get started. A Permanent Account Number or PAN card is one of the most basic requirements for engaging in any instead financial transactions in India, including the buying and selling of shares on the stock market. This card contains a unique 10-digit alpha-numeric number given to every tax-paying citizen to assess their tax liabilities by the Income Tax department. This is the next step. Unfortunately, you can’t just walk into the share market and start buying and selling shares as you please. This can only be done through an authorized agent or broker. Brokers can be individuals or companies – but in both cases, they have to be registered & licensed by the SEBI (Securities and Exchange Board of India). You can either opt for the services of an individual, licensed broker or a reputed brokerage company with a good track record of trading in stock market instruments. Once you have found yourself a broker, it’s time for you to open an online Demat account – which will keep track of all the shares you will buy and sell. Do note that you will never receive a physical certificate for any of the stocks you buy. There are several leading banks and financial institutions which offer Demat account services for free or a small fee/commission – so go ahead and take your pick. For the actual buying and selling of shares, you will need to have a trading account. Your broker can open one for you. You will also receive a monthly Demat statement to help you keep track of all the trading (buying & selling) activity in your account. This depository will hold and release the shares which you buy and wish to sell shares on the share market respectively. You get to choose between two depositories namely the National Securities Depository Limited (NSDL) and Central Depository Services Limited (CDSL). Again this can be taken care off by your broker on your behalf; however, you need to be fully aware of which depository is holding all your shares for you. A Unique Identification Number (UIN) is required if you wish to engage in significant transactions involving amounts in excess of INR 1,00,000 (per transaction). However, it’s not needed for regular usually. Now that you know the fundamental requirements, I will show you how to buy and sell shares. After identifying which share you want to buy – you need to immediately inform your broker about it, including the price and quantity you wish to purchase. For example, say you want to buy 20 shares of Company X – but only when its share price touches INR 100 per share. You will need to inform your broker accordingly. You can place your order via the phone directly or online through the broker’s website or software. Sure enough, once the share price of that particular company has reached the cost specified by you – your broker will buy 20 shares on your behalf – which will be reflected in your demat/trading account accordingly. The same process cost when selling shares. For example, you want to sell 10 shares of Company Z – for a price of INR 150 per share. Your broker will process your sell order when the cost of that particular share reaches INR 150/per share. The point to note here is that Buy or Sell orders remain valid only for a fixed duration of time – generally for 24-48 hours. If the transaction is not processed within this timeframe for whatever reason, the order is cancelled, and you will have to issue a fresh order. The Bombay Stock Exchange and the National Stock Exchange are the only two stock exchanges where the buying and selling of shares and commodities take place in India. It is essential to mention your choice of exchange to your broker since there is usually a small disparity in the prices of shares listed on both exchanges. To help you make a prudent choice, we have listed some necessary information about both exchanges for your reference below. In case you still can’t decide, your broker can help you make an informed decision. Located on Mumbai’s famous Dalal Street, the BSE was formally established in 1875. It is also Asia’s first stock exchange and is also reputed to be the world’s fastest stock exchange with a speed of 6 microseconds. The BSE is also the country’s first listed stock exchange. It has a reputation for providing a transparent and efficient platform for trading in equity shares, currencies, debt instruments and mutual funds among others. It also has a platform for trading in shares of small-and-medium enterprises. The S&P BSE SENSEX – BSE’s popular equity index, is also rated as the country’s most widely tracked benchmark index and is traded globally in leading exchanges of BRICS (Brazil, Russia, China and South Africa) nations. The Mumbai-based NSE is India’s leading stock exchange and the fourth largest in the world (by equity trading volume in 2015), as per the World Federation of Exchanges (WFE). Launched in the year 1994, it’s also rated as India’s largest stock exchange in India by the SEBI (regarding total and average daily turnover for equity shares) every year since 1995. It enjoys the distinction of launching electronic screen-based trading way back in 1994 and was the first to introduce internet trading in India in 2000. It has a fully-integrated business model which includes trading services, exchange listings, indices, market data feeds, technology solutions and settlement services. People invest in the stock market with the hope of making it rich; can be highly risky for those who don’t know their way around, in terms of which stocks to buy and when. The volatility of the stock market can be too much to handle for most beginners, but not for those who know the value of patience and persistence. The thumb rule to invest in the stock market is always about getting your basics right, before putting your hard earned money into equities. But no worries – we have a handy ten-point guide in place below which will make it easier for you to invest in the share market. Earnings per Share – Or EPS. It should show an increase over a five year period. Price to Book Ratio – or P/B. It should be lower than other companies in the same vertical. Debt to Equity ratio – Ideally this should be less than 1. Price to Earnings Ratio – or P/E which needs to be lower than competing companies. Dividend – or a share in the profits paid to its shareholders. Should show an increase over the past five years. You can also take advice from an experienced industry analyst for the above. Assessing the overall future outlook for that particular industry is also an excellent way to arrive at a share investment option. Understanding the company and its portfolio of products and services should play a key role in your decision. A company with a unique and easy to understand business model usually makes for a safe stock investment bet. Plus it helps if it’s a known company and has a good market reputation. The ideal thing to do would be investing in the shares of the company that you understand very well. This will help you in knowing when to buy a particular share, hold or sell the stock of the said company. It’s always the top management if a company that takes all the crucial business decisions which can make or break the company’s bottom line. Hence make it a point to know who is in charge of making critical decisions in any company before you decide to invest in the shares. A qualified and well-experienced management team will always make decisions which will help the company prosper and touch new heights of success – which should do wonders for the market price of its shares and the net worth of your investment into the company. No one likes to invest in a loss-making company, and a company with high debts does not make for a healthy investment. Knowing the company’s debt-to-equity ratio will help you understand the amount of debt it holds against the numbers of shareholders. The lower the debt-to-equity ratio of the company (vis-à-vis the industry average), the safer it will be for your stock investment. Always make it a point to steer clear of companies with considerable debt. Great is an important metric used to verify if the price of the stock you want to buy is — fair, attractive or outright expensive. Valuation ratios are often used to determine how companies stack up against their competition and to assess if they are over/undervalued in the industry they operate in. A good way of knowing this is to review their Price/Earnings ratio (P/E). Banks usually use the P/B (Price to Book) ratio to base their valuations of a particular company. Just because a company has delivered big profits in the past does not guarantee it will do so in the future too. There have been several cases in the past where profit-making companies have suddenly started churning losses due to an unforeseen change in the market situation. The continued growth of any company depends on multiple factors including; USP of its products & services, style of management, demand & supply and industry scenario among others. Mid-caps or medium-sized listed companies often give the best returns on investment. The reason being unlike many large caps which may have reached a saturation point in terms of their growth prospects, mid-caps have the potential to grow larger in the long term. Moreover, mid-cap companies frequently have a higher rate of growth, have excellent cash reserves (meaning they are mostly out of debt) and survive longer. All of which makes them a prime prospect for delivering attractive returns on your investment. Every so often people buy a company’s shares because they are getting them cheap. What they fail to understand is some companies price their shares low because of limited growth prospects. By the same yardstick, some highly-priced shares can make for good buys because of their future potential for growth. So don’t let the price of the stock be the only criteria to base your investment decision on, instead just one of several factors that you find your final decision on. Trying to predict the top price a share will reach or where it will bottom out, and timing you’re buying or selling of stocks according to these frivolous predictions can lead you straight to financial ruin. More people have lost money trying to time the market than people who have made money. According to market analysts catching the top or bottom of the market is virtually impossible and a pure myth, yet people attempt doing it all the time and lose their hard earned money in the process. Never fall prey to market rumours about inflated stock prices or base your investment decision purely on speculation. Still, please make it a point to check the fundamentals of stock before rushing to buy it. Do remember that once the share is purchased, the transaction is deemed completed and cannot be reversed – just because you based your decisions on speculation, rather than hard facts. So stick to facts or risk burning your money – the choice is yours. By now, you might be thoroughly aware of some of the ways in which you can invest in the stock market easily. The irresistible desire of minting big money on the stock markets has always been a massive lure for scores of investors. Many of them have invested their life savings in the hope of making money many times over. But the fact of the matter is becoming a successful stock market investor requires tons of patience and perhaps an equal amount of discipline. Add to this the willingness to engage in in-depth research and a sound understanding of the markets and how they function. But for those who have what it takes, to invest in the share market can indeed catapult them to the very top of the money mountain. While there is no sure-shot formula yet for getting there, having realistic expectations combined with a disciplined investment approach is a great way to get started with your stock marketing.